Where to find Worcester hotels near an airport? Where can I find hotels in Worcester that are near tourist attractions? With 14 Expedia-listed hotels in Worcester, visitors here have plenty of options to consider. You'll find around 14 apartments and hotels are located within a 0.1-kilometre (0.06-mile) radius of Worcester's town center. 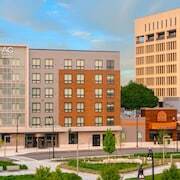 Within a 1-kilometre (0.6-mile) radius of downtown Worcester, you can enjoy some great accommodation options, including the Hilton Garden Inn Worcester and Holiday Inn Express Worcester Downtown. With 8 Expedia hotels, Westborough is an accommodation neighborhood that makes a good place to stay. It is 16 kilometres (10 miles) from downtown Worcester. The Residence Inn By Marriott Boston Westborough and The Sleigh Maker Inn Bed and Breakfast are amongst the hotels in Westborough. Another popular place to stay is Auburn. 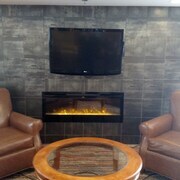 Auburn is home to the Fairfield Inn & Suites by Marriott Worcester Auburn and Hampton Inn Auburn. Or, try Shrewsbury, where you'll find the Days Inn Shrewsbury Worcester and Rainbow Motel. The Residence Inn by Marriott Boston Framingham and Sheraton Framingham Hotel & Conference Center can be found in Framingham, while Embassy Suites Boston/Marlborough and Courtyard by Marriott Boston Marlborough are part of the Marlborough area. Budget travelers can breathe easy. Worcester features loads of lower-priced hotels and accommodations. 8 kilometres (5 miles) from Worcester's downtown you'll find the La Quinta Inn Auburn Worcester. The Suburban Extended Stay Hotel is only 5 kilometres (3 miles) away. The Best Western Royal Plaza Hotel & Trade Center and the Quality Inn & Suites Worcester are alternative budget hotels well worth looking into. 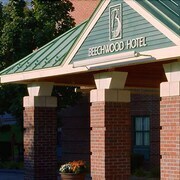 You could try the Beechwood Hotel as well as the Residence Inn by Marriott Worcester. The Beechwood Hotel is positioned 3 kilometres (2 miles) from the heart of Worcester. 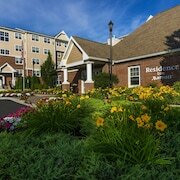 The Residence Inn by Marriott Worcester, is situated 4 kilometres (2 miles) away. Some other hotel and apartment options around Worcester include the Courtyard by Marriott Worcester and the Comfort Inn & Suites. If you'd like to experience more of the rural landscapes and rolling hills in this section of United States of America, you may choose to plan extra nights in other parts of Central Massachusetts. Spend time skiing or venture out to see the region's tourist attractions. Suitable accommodations are on offer. 30 kilometres (19 miles) from Worcester is Leominster, where you can find Fitchburg State University and Wachusett Mountain Ski Area. The Doubletree by Hilton Hotel Leominster and Days Inn Leominster /Fitchburg Area are some of the fabulous Expedia-listed long and short-stay options in Leominster. 30 kilometres (17 miles) to the southwest of Worcester, you can also stay at Sturbridge, home to the Hampton Inn Sturbridge and Sturbridge Host Hotel & Conference Center. The Old Sturbridge Village and St. Anne's Shrine are just a couple of the more popular sites to experience while in Sturbridge. If you are planning on arriving via Logan International Airport, you may find it convenient to book accommodation at The Ritz-Carlton, Boston, or Fifteen Beacon, which are both conveniently close. What are the most popular Worcester hotels? Are there hotels in other cities near Worcester? What other types of accommodations are available in Worcester? Explore Worcester with Expedia.ca’s Travel Guides to find the best flights, cars, holiday packages and more!